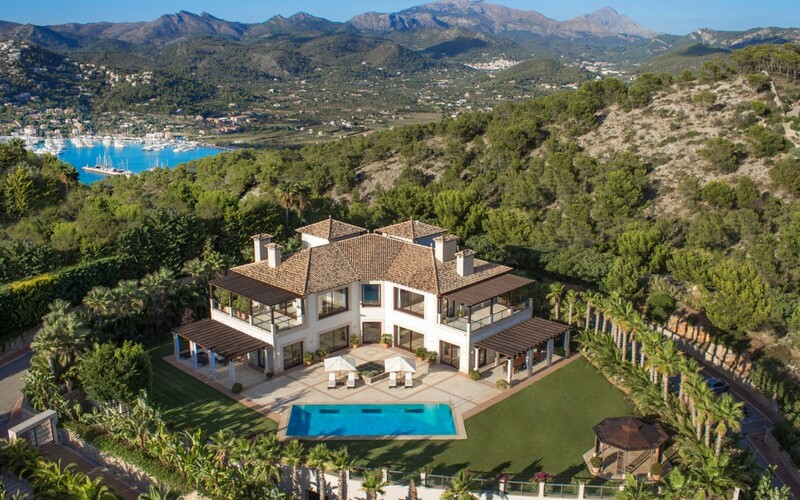 Villa Sa Terra Rotja, in the vast estate of Son Bunyola, is located approximately 40 minutes from Palma. The traditional Mallorcan villages of Banyalbufar and Esporles are a few kilometres away from the Son Bunyola estate, providing a variety of restaurants, tapas bars and other local amenities. Located on the picturesque Spanish island of Mallorca, the estate of Son Bunyola covers 680 acres of stunning landscape on the northwest cost of the island, surrounded by grape vines and olive and citrus trees. The vast estate of San Bunyola includes three villas available for exclusive bookings, Sa Terra Rotja, Sa Punta de S’Aguila and Son Balagueret. Relax and unwind with family and friends in a tranquil setting that perfectly balances the need to ‘get away from it all’ with the opportunity to explore the great outdoors and sample some of the best the Balearic Islands has to offer. Literally translating as ‘red earth’ from the local Mallorquín language, Sa Terra Rotja is a luxury villa situated near the edge of the estate of Son Bunyola and a 20 minute walk from the pebble beach. 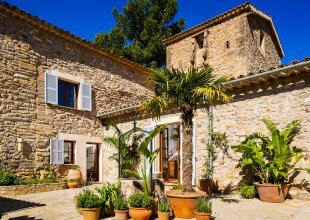 Sa Terra Rotja accommodates 8 adults in 4 spacious en-suite bedrooms and the generous communal space is decorated magnificently in a traditional Mallorcan style with exposed beams and terracotta tiled floors, offering luxurious decor that is complemented beautifully by the elegant furnishings. It blends new with old perfectly, offering the mod cons which any family could wish for; Sonos sound-system controlled by the villa iPad; Bose speakers; Laptop for client’s use; PlayStation 4, TVs with English channels and children's toys. Not forgetting the addition of a BBQ and table tennis table. This stunning villa also benefits from a private heated swimming pool, a shared tennis court (adjacent to the Villa) and plenty of space on the terrace for sunbathing. The Villa's private terrace is a perfect place for lazing away on with mesmerising views overlooking the crystal clear waters and the rugged coastline. Price is based on a fully exclusive basis of Villa Sa Terra Rotja. The rate includes a daily continental breakfast and lunch and dinner with complimentary drinks for six nights of your stay. • Bedroom 1: Double/Twin bedroom with en-suite shower room and access to patio. • Bedroom 2: Double/Twin bedroom with sea views, sofa bed and walk-in wardrobe. En-suite bathroom with bath and separate shower. • Bedroom 3: Master bedroom with walk-in wardrobe, desk and sea views from the private balcony. En-suite bathroom with bath and separate shower. • Bedroom 4: Double/Twin bedroom with countryside and sea views and an en-suite shower room. One of the most important aspects of staying at Son Bunyola is taking advantage of the fresh produce the island has to offer. Our chef travels to the local markets every week to get the freshest vegetables and meats for you to enjoy during your stay. The menus have a huge influence on local produce: fish, lamb, meats, cheeses, fresh bread and pastries and of course olives. All served up with local Mallorcan wine or your favourite tipple. Our chefs and hostess will prepare a selection of cold dishes for breakfast before leaving each evening and you can help yourself in the morning, so there’s definitely no need to rush up! Lunch is served buffet style and three-course dinners can be tailor-made according to your preferences, or we can serve local Mallorcan and Mediterranean style dishes. All drinks including alcoholic beverages are included and you are welcome to help yourself. Our team will chat to you before you arrive to make sure we have everything you need in stock. On one day during your stay we can arrange for you to visit some of the local restaurant offerings and are happy to organise reservations. With a dedicated team offering a faultless concierge service who will take care of everything for you from arranging activities such as walking, hiking, cycling, golf, sailing, canoeing and deep sea fishing to booking spa treatments and babysitters.